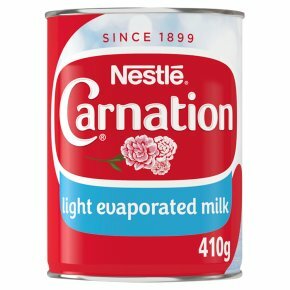 Evaporated semi skimmed milk fortified with Vitamin D.
Each can contains 410g of Carnation® Light Evaporated Milk. Less than 5% fat. A deliciously creamy light topping for all your favourite desserts. Made using fresh milk - rich in calcium and Vitamin D. Suitable for vegetarians. Carnation® Evaporated Milk Light is a deliciously creamy yet light topping for all your favourite desserts. From fresh fruit salad to apple crumble, or sticky toffee pudding - they all taste equally fantastic topped with low fat evaporated milk! Made from fresh skimmed milk, our low fat evaporated milk has less than 5% fat - making it a tasty light alternative to our classic Carnation® Evaporated Milk. Just like regular evaporated milk, it's also deliciously creamy in hot drinks; next time you're having a cup of coffee with friends, why not try Carnation® Light Evaporated Milk in coffee?